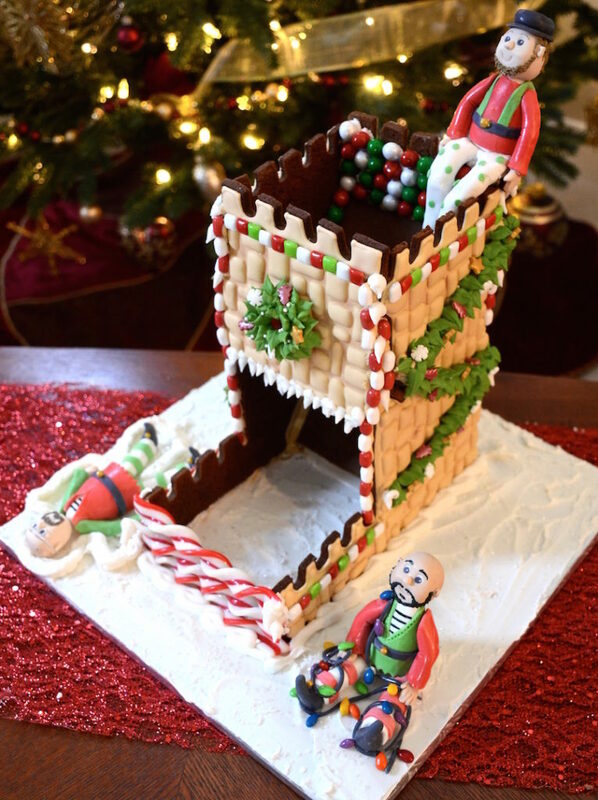 Who needs a house when you could have a working Gingerbread Dice Tower complete with 3 magical elves instead?! 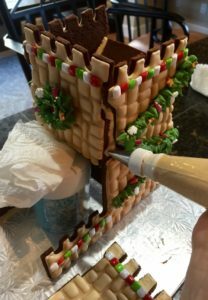 Interested in making your own Gingerbread Dice Tower? 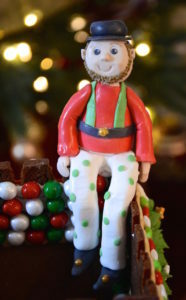 I’ve made it easier by sharing the pattern and baking pics below. 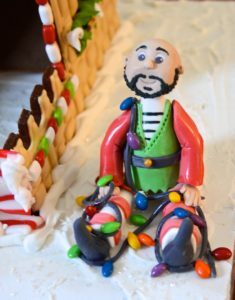 The recipe I use is from a book I’ve had for many years called Gingerbread Houses. 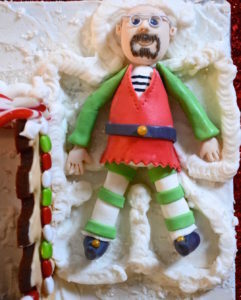 There are so many great gingerbread house recipes on the internet. Be sure to pick one that is just for house making because it needs to be very sturdy. 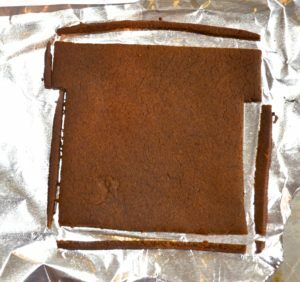 Roll your gingerbread dough out onto heavy duty foil so you can easily transfer it to a cookie sheet. The dough needs to be rolled out very thin. 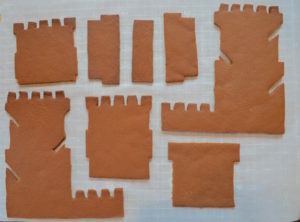 Use the pattern to cut out the cookie shapes, and bake as your recipe states. 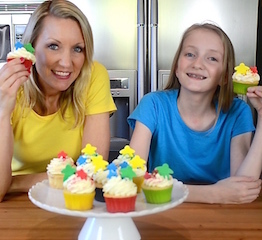 Immediately after your pieces come out of the oven, you will need to re-trim them. 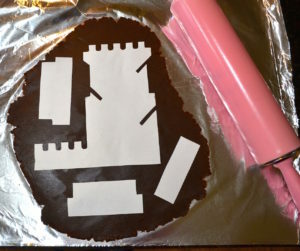 Position the pattern onto the cookies and cut around the edges with an xacto knife. Once the cookies are cool and hardened, test to see if they fit together properly. If not, carefully sand them down as needed with a sharp knife or sandpaper. 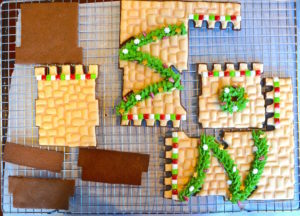 If you like to do detail work on the cookies, it’s easiest to do while they are lying flat. 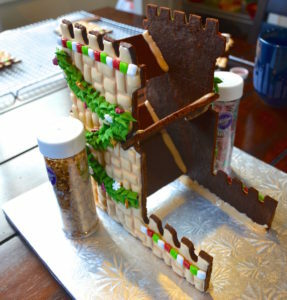 Glue the pieces together using royal icing. I like to use sprinkle containers to help hold the walls up until the icing dries.